I was a bit nervous that day. I went to bed early with the idea having a good night of sleep. The next day was going to be hard and I wanted to be in the best shape possible. To be honest, when I think too much about something the opposite happens. I had a really bad night. I had searched for a place to sleep because I wanted to sleep well and recover my muscles a little bit. Sleeping in a bed helps a lot with this. I was in Paposo, a very small village on the coast of the Atacama desert. Paposo didn’t have any hostals and less any hotel. Nothing official at all, but asking here and there usually leads to a place. After asking in three shops I found a “pension” where workers from the road would sleep and spend their free days. I needed a good rest before “The Ravens”. “The Ravens” was the name we gave to this stretch of road between Paposo and La Negra, in the Antofogasta Region. Right in the middle of the Atacama Desert. This stretch of road was a lane of 160 kilometers of pure desert. Not a single soul living through it. Not a house, gas station, goat keeper hut, restaurant of any sort, lest think about a stream of water coming from the mountains. 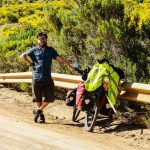 Until this point I had tasted bits of the Atacama desert, but I had always found spots where to get the vital element and food. Every 50 to 80 kilometers there was a restaurant, a gas station or a town where to refill my bottles. Enough to refill every day at least. At the ravens, there was no possibility at all. 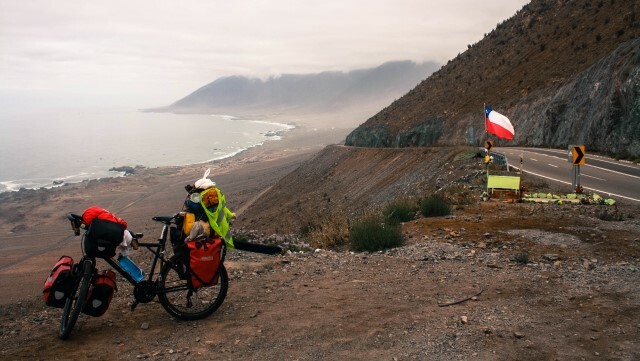 I had to carry everything for a journey of three days, which was what I had estimated it would take me to reach from point A, Paposo, to point B, La Negra. The hardest was not the distance, so far I had been riding days of 100 and 120 kilometers with no big issues, if the ravens were flat, in 2 days I would be at La Negra. But the distance was not all. Paposo is a village on the coast, this means its altitude is 0 meters above sea level (m.a.s.l.). From here, the road was a constant climb till 2100 m.a.s.l. in 45 kilometers. I had never done such a climb and with such inclination. Not even on the southern Andes I had faced something like that. The fact that there is no water plust temperatures made this a real challenge. The name “the ravens” came up when I told my friend Javier about the road I was going to follow. He, knowing quite well the north of Chile and its roads, was giving me good advice on what things to expect and gave me his opinion every time I asked him about certain parts of the desert. When I told him about my idea of doing the Paposo climb he couldn’t help it but to burst out “Oh no man, I see the ravens above you!”. I found this so damn funny that I named the stretch of road “The Ravens”. I woke up at 6 am. I had to start the climb before the sun shined over the starting point of the climb. Avoiding the sun was essential. At 6.45 I was ready with the bags outside the “pension” and I just need to mount everything on the bike to leave. Mr. Murphy and his law shows up when you least expect him. He showed up. The rear wheel was flat. The mind started to think rapidly; “stay one more day”, “it will take too long to fix and the sun will hit you”, “this is a sign so you don’t leave”. There is to avoid thinking too much and there is to do what there is to do. I took the bike outside and started fixing it immediately. Once I had changed the inner tube I thought about patching the punctured one, it was 7.20, I was already late and the sun was not going to wait for me. 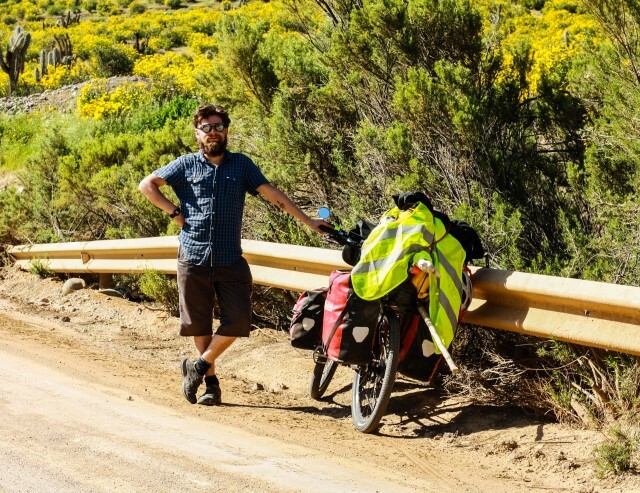 I decided to trust in the odds and threw myself to the desert with the punctured spare inner tube. I mean, I hadn’t had a puncture in weeks. How unlucky could I be that I had another puncture this day?. I left the pension at 7.30 and the climb started immediately. After 1 hour of pushing my pedals I had advanced 5 kilometers. Paposo was still right there, but under me now. I was already in altitude. The sun was still not shining upon me but I was sweating like a race horse. I ended up taking everything out, t-shirt and pants. I started riding only with underwear. At this point you don’t really care about anything and you only focus in pushing the pedals. The sun slowly tried to break up the morning clouds but couldn’t do it yet. No cars on the road either, it was Christmas day and few people travel on these holidays, less in the desert. The road took a bend and I started to notice flags all along the road, then little crosses everywhere, then more flags and crosses. Then little shrines showed up all over the place. I looked around in confusion only to find the reason of all of this flags and shrines. Wreckages of who knows how many accidents; many cars, pick ups, a couple of huge trucks, being there since who knows when. Lots of destroyed things, probably the cargo of the trucks and things that people didn’t even bother to retrieve. A real cemetery right there in the middle of the cliff that would explain the amount of flags, crosses and shrines. I managed to count at least 12 vehicles still in the cliff. With no intention on stopping and reflecting on those accident I kept on. I still had a lot to go up. I kept pushing it, slow but steady. At around 10 the sun managed to break the clouds and started to shine, strongly upon my skin. With this, temperatures started to raise fast and the stream of light started to burn hard. Time to cloth on and cream on. Desert attire and a ton of sunscreen on my face. I kept pushing it. The ascent speed was of 5 kilometers per hour and who know with how much weight on my bike. I had estimated 7 liters of water for the three days, I loaded 8, just in case. Couple of days before I met an Austrian dude also on a bicycle, he told he had had 20 liters with him for this stretch. The thought of carrying 20 liters of water on the bicycle made me seriously doubt of my 8 liters, but why so much man? 20 liters is simply insane. I kept pushing it. From time to time I would stop to breath, take pictures, scream, whistle and resume the pushing. Eternal climb. Climb of the mind. The landscape wasn’t desert, not yet. The influence of the pacific ocean could still be noticed. Bushes all around, birds, even mice would cross the road from time to time. I even saw trees, two I think. I kept pushing the pedals. As I was going higher and higher I started to notice how the landscape was slowly changing, at the same pace I was going up. Bushes started to get replaced by boulders. Some minor mining camps would show up also from time to time, unmanned because it was Christmas day. And I kept pushing. I had already drank 1 liter of water. And I kept pushing. The landscape would change again. Sandy hills started to show up. Sands of many different colors would cover the landscape, yellows, reds, oranges, I was getting there. Some hills were white, others were a mix of all the colors. Yeah I was getting there, I could see the ravens on the distance, or was this an illusion?. I kept pushing. I could actually see the summit on the distance. I was really near the first milestone, kilometer 35. Here the ascent degree would lower a bit. The next 10 kilometers would be easier, or so I supposed. The wind was on my tail and would help on the climb, it hadn’t been as hard as I had thought. Maybe that was the biggest mistake, I had thought too much. I had drank already 2 liters of water, I was drinking to much I thought, but then I had to do it. I was already in altitude and almost reaching the first summit. The pace was still slow due to the gradient of the climb. But I was going, steady. From time to time a car or truck would pass on, sometimes a bus. The honks kept the spirit up. A car that was coming in the opposite direction slowed down. A man yelled “Want a banana? !” – “Hell yeah man!”. A young guy came off the car with a banana, some apples and a bottle of water. “For your journey! Keep it on, you are brave! Good luck!” and he departed saying no more. I had a couple of bananas, a couple of apples and half a liter of water to replenish my stock. Humans are good I thought. I still had to climb some kilometers to reach the first milestone. Km 35 was where the harder gradient would lower its degree. This was fast, after a couple of bananas I had more forces to keep on. When I reached this first summit I decided to stop. It was 13.45 pm and the sun was hitting hard. I had been already 6 hours on the bicycle just going upwards. 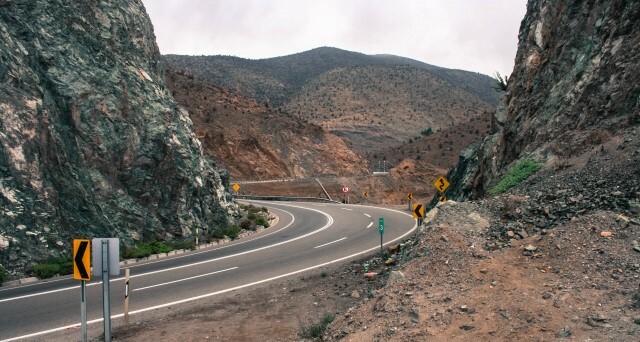 What I had learnt in my time at the Elqui Valley was a good lesson. There is to start the work early in the morning, avoid the midday sun, sleep a siesta and keep on with the work at the evening. In this way you work efficiently and do not burn yourself. I was applying this perfectly. I found shade under the side barrier of the road. Enough shadow to cover my back and part of my legs. Enough shade to cover the bottle of water and the food I was going to have. 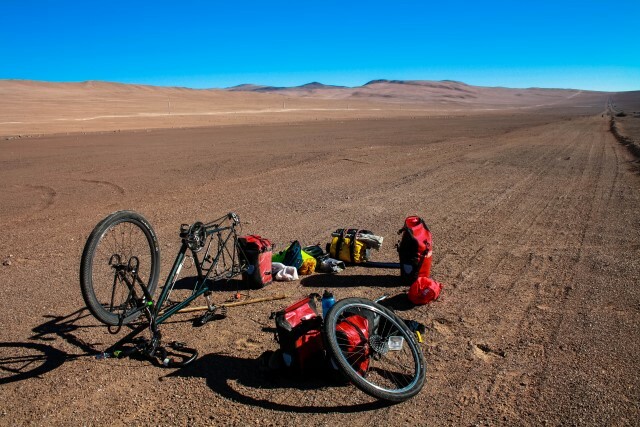 Enough shade to eat, contemplate and spend 3 hours resting in front of the Atacama desert. Winds started to rise stronger. After 3 hours of good rest and letting the mind wander through the desert landscapes I decided I had to keep on. I would push it only 10 more kilometers, till the end of the climb. The idea was to camp there as the effort had been already too much. Just 10 more kilometers. It took me around 1 hour to advance these 10 kilometers. When I reached the summit the sun was still high up in the sky. I had plenty of day time still. And my legs?, well, they were still in good shape, or so I felt, although they were trembling. I could advance a little more maybe?. There was a downhill now, short but downhill. I decided to go down and over there decide if I had forces enough to go up the next slope. I went down. It was marvelous to feel the bike to move by itself. I enjoyed every bit of every kilometer going down the hill. It was short, but it was marvelous. When I was in the valley the ecstasy of the downhill was so high that I decided I would up again the next slope. Just to have the fun of going down again. I had already gone up 45 kilometers, going 7 more upwards was not really bad. The wind was on my back and my legs still would answer to my call, I supposed. I started to go up again. When I was about to reach the summit, maybe a couple of kilometers away something felt odd on the bike. I looked to the front part, all was ok. I looked to the backside and I spotted the problem. Flat tire. I instantly recalled the punctured spare part. Oh no, big problem in here. I had no way to fix the puncture and I had no replacement for the inner tube because I had already changed it before leaving Paposo. My mind started to panick. But as soon as I started panicking a truck showed up and started to signal with its lights. It stopped in front of me. The driver started yelling; “What the hell are you doing in the middle of the desert? !” – “I’m going northwards and I have a flat tire, what about you?” – “I’m going back home because it’s Christmas, boy, why are you here alone in the middle of nowhere!?”. I told him my story. He couldn’t believe I had been cycling so much. I think he was more impressed that I was alone rather than riding bicycle. He asked if I wanted something to drink which of course I couldn’t say no. He crossed the street with the truck and from the windows he gave me a bottle of fanta. “For the Christmas dinner” he told me. He wished me luck and courage and kept on his way. With the bottle of fanta in one of my hands and the rear wheel punctured I stepped out of the road. I sat there and drank some of the fanta. It was damn hot. I had to save it for later. I had to fix myself in order to continue otherwise I would be stuck there for the night. I had to think on how to find the puncture. Usually that is done with a bucket filled with water, you submerge the inner tube inside the water and when you see bubbles, there you have your puncture. But I was in the middle of the desert, I had no bucket and had no water to spare. Other option is to feel the air draining from the inner tube, but it was to windy to feel anything at all. I drank some water. Maybe I could just break a bottle to get a bucket. But that meant getting rid of 2 liters of the vital element. No can do. What about the fanta bottle? Well, it was a 500 ml fanta bottle, too small for the job. It was 6 pm. Oh crap. I looked up at the sky searching for the answer. It wasn’t there. So I just let myself fall into the desert and kept looking at the sky. I started to breath and stopped thinking at all. There is to take the life slower I thought. And just stood there for a while looking at the sky. Suddenly a picture showed up in my mind. I had a really small tupperware that could be used to find the puncture. Small but wide enough to submerge part of the inner tube. I used to carry butter there, but as the heat of the desert was too strong the butter I had inside melted many days ago. The tupperware was empty. I rose up, really slowly, but happy. In 30 minutes I had fixed both punctures and had used only 200 ml of water. It was almost 7 pm. I decided to end the climb and camp. It was Christmas and I had a fanta bottle with me. I arrived to the airfield of the Paranal observatory. A landing field in the middle of the desert, without control tower, without guard house, neither a shelter, nor anything. Just the airfield. I got close to the landing strip and camped right there. It was Christmas and I was going to eat well, and drink fanta. Pop corn, scrambled eggs, tomato and avocado. And a fanta that was already cold. The stars in the sky were marvelous and I was right there in the middle of the Atacama desert, having the fun of my life. The next day I didn’t get up early. I had advanced way more than I had thought to do. I just chilled and relaxed till very late. During that day I advanced enough to be 20 kilometers away from La Negra. I still had 1 ½ liter of water and that was enough for a day. As for the ravens, I didn’t even see any. Maybe they don’t even live up there, too dry for whatever to live up there. Better that way, it wasn’t as bad as to see the ravens, but an enjoyment for the desert travelers.